Kick off your visit on the 15th (Mon): stroll around Stanley Park and then explore the striking landscape at Vancouver Seawall. Get ready for a full day of sightseeing on the next day: explore and take pictures at Capilano Suspension Bridge Park and then take a stroll through Granville Island. To find where to stay, photos, more things to do, and more tourist information, read Vancouver planning app . Use the Route module to find suitable travel options from your home destination to Vancouver. In April, plan for daily highs up to 16°C, and evening lows to 8°C. Wrap up your sightseeing on the 16th (Tue) to allow time to travel to Central Saanich. Central Saanich is a district municipality in Greater Victoria and a member municipality of the Capital Regional District. 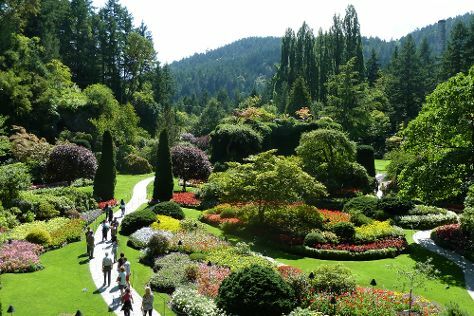 On the 17th (Wed), take in nature's colorful creations at Victoria Butterfly Gardens, admire all the interesting features of The Butchart Gardens, and then walk around Mount Douglas Park. For other places to visit, where to stay, maps, and tourist information, you can read our Central Saanich online trip maker . Traveling by combination of flight and bus from Vancouver to Central Saanich takes 2 hours. Alternatively, you can do a combination of car and ferry; or fly. Traveling from Vancouver in April, things will get slightly colder in Central Saanich: highs are around 9°C and lows about -3°C. Cap off your sightseeing on the 17th (Wed) early enough to travel to Jasper National Park. Jasper National Park is known for nature, scenic drive, adventure, trails, and spas. Your plan includes some of its best attractions: fly down the slopes at Marmot Basin Ski Area, trek along Old Fort Point Loop Trail, get outside with Lac Beauvert, and stroll through Beauty Creek Trail. For ratings, more things to do, traveler tips, and more tourist information, use the Jasper National Park tour itinerary planner. Getting from Central Saanich to Jasper National Park by combination of flight and bus takes about 9.5 hours. Other options: do a combination of ferry and car; or do a combination of flight, bus, and train. The time zone difference when traveling from Central Saanich to Jasper National Park is 1 hour. When traveling from Central Saanich in April, plan for a bit warmer days and about the same nights in Jasper National Park: temperatures range from 13°C by day to -3°C at night. Wrap up your sightseeing on the 20th (Sat) to allow time to take a shuttle to Banff National Park. On the 21st (Sun), spend an exhilarating day on the slopes at The Lake Louise Ski Resort. 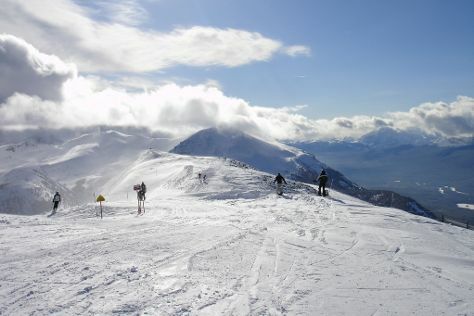 On the 22nd (Mon), spend an exhilarating day on the slopes at Sunshine Village. There's still lots to do: contemplate the waterfront views at Lake Louise, look for gifts at Wilsons Mountain Sports, and tour the pleasant surroundings at Big Beehive. Take the guesswork out of planning a Banff National Park vacation by using our trip itinerary maker. Traveling by shuttle from Jasper National Park to Banff National Park takes 3 hours. Alternatively, you can drive. When traveling from Jasper National Park in April, plan for slightly colder days and about the same nights in Banff National Park: temperatures range from 9°C by day to -4°C at night. Finish your sightseeing early on the 23rd (Tue) to allow enough time to travel to Ottawa. On the 24th (Wed), contemplate in the serene atmosphere at Notre Dame Basilica, then see the interesting displays at National Gallery of Canada, and then get a sense of history and politics at Parliament Hill and Buildings. To see maps, reviews, and tourist information, read Ottawa online trip maker . You can do a combination of bus and flight from Banff National Park to Ottawa in 9.5 hours. Alternatively, you can do a combination of bus, flight, and train; or drive. Traveling from Banff National Park to Ottawa, you'll lose 2 hours due to the time zone difference. Plan for somewhat warmer nights when traveling from Banff National Park in April since evenings lows in Ottawa dip to 0°C. Finish your sightseeing early on the 24th (Wed) so you can take a train to Montreal. On the 25th (Thu), make a trip to Notre-Dame Basilica, then contemplate in the serene atmosphere at Saint Joseph's Oratory of Mount Royal, and then admire the masterpieces at Musee des beaux-arts de Montreal. Keep things going the next day: have some family-friendly fun at Maniax and then make a trip to Old Montreal. Traveling by train from Ottawa to Montreal takes 2.5 hours. Alternatively, you can drive; or take a bus. In April, daytime highs in Montreal are 12°C, while nighttime lows are 2°C. Finish your sightseeing early on the 26th (Fri) to allow enough time to travel to Niagara Falls. Kick off your visit on the 27th (Sat): pause for some serene contemplation at Nathaniel Dett Memorial Chapel British Methodist Episcopal Church, then take in the dramatic scenery at Niagara Falls, then make a trip to Journey Behind the Falls, and finally take in panoramic vistas at Skylon Tower. To find reviews, traveler tips, other places to visit, and other tourist information, read Niagara Falls tour builder website . Traveling by combination of flight and train from Montreal to Niagara Falls takes 5.5 hours. Alternatively, you can take a train; or drive. In April, daily temperatures in Niagara Falls can reach 15°C, while at night they dip to 2°C. Wrap up your sightseeing on the 27th (Sat) early enough to drive to Toronto. 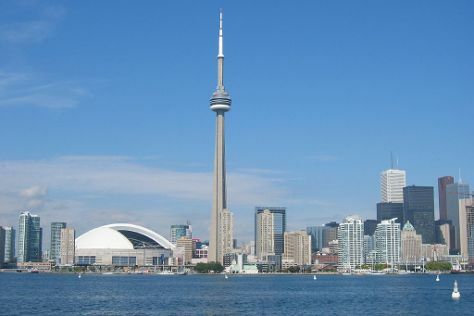 Kick off your visit on the 28th (Sun): contemplate in the serene atmosphere at St James Anglican Cathedral, appreciate the extensive heritage of The Distillery District, then enjoy breathtaking views from CN Tower, and finally observe the fascinating underwater world at Ripley's Aquarium Of Canada. Get ready for a full day of sightseeing on the next day: see the interesting displays at Royal Ontario Museum, examine the collection at Casa Loma, and then take in the spiritual surroundings of St Michael's Cathedral Basilica. To see ratings, other places to visit, reviews, and tourist information, you can read our Toronto trip itinerary maker tool . Getting from Niagara Falls to Toronto by car takes about 1.5 hours. Other options: take a bus; or take a train. In April, daily temperatures in Toronto can reach 13°C, while at night they dip to 3°C. Wrap up your sightseeing on the 29th (Mon) early enough to travel back home.